- Start at Pleinmont near the moto-X track, finish at Pembroke. - Start at Fort Hommet (Vazon), finish at Pembroke. Cut-off time for both distances is 14:30 at Pembroke.... and I promise not to put the last buoy so far out this year. Instructions for the full and half course routes, plus mandatory kit and race rules can be obtained on the club Facebook page or by email from Dan Armsden. 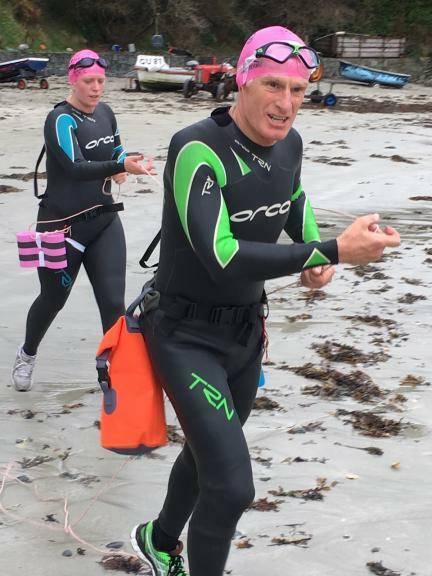 To get an idea of numbers, please post the names on Facebook of you and your SwimRun partner, together with Full or Half for the distance, or again, email Dan. As always, we need volunteers to make this work, so if you or anyone you know can help with any of the following please post on FB or email Dan. * Kayakers / SUPers, not necessarily needed in the water, but to be able to react quickly from the shore. Ideally mobile with a vehicle if possible. * Volunteers to man the aid stations and keep a log / time of all pairs passing each aid station.